Last Sunday we were delighted to observe two Adelaide Rosellas in our garden. It has been several years since our last sighting of this species so close to home. They are infrequent visitors, coming here every few years, sometimes staying around for a few weeks before leaving again. 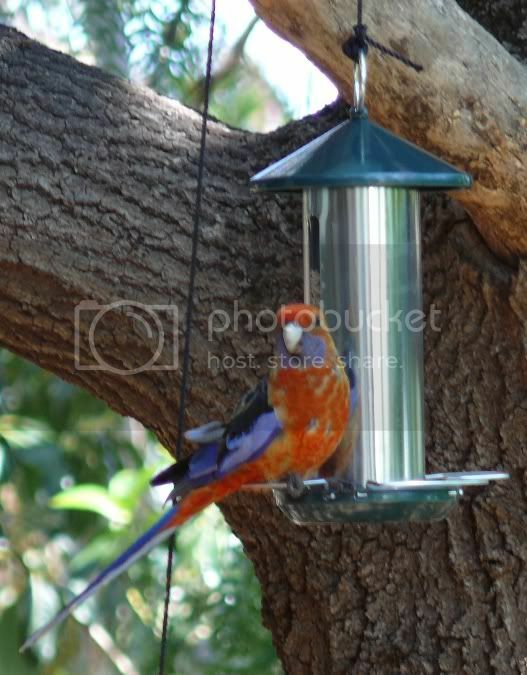 The Adelaide Rosella is a common parrot of the Mt Lofty Ranges and Adelaide Plains in South Australia. They are common about 30 to 40 kilometres to the west of here in Murray Bridge. In my encounters with this species, the River Murray is about the furthest east that they venture. This species is actually a hybrid of the Yellow Rosella found further upstream along the River Murray and the Crimson Rosella of eastern Australia and the south east part of South Australia. The feathers can vary from a rich orange through to a quite pale washed out colour. The photos shown above and below were taken at Gawler, north of Adelaide. Several years ago I saw a pair of Adelaide Rosellas for sale in a bird shop. I did not know what they were but thought they were so beautiful. I later went back and purchased them and then tried to trace where they had come from. I found the trail began in California. They were probably bred there by a breeder. Then they were sold to another breeder in Oregon where I live. He kept them outside in a large flight with attractive plants and flowers. But they never bred so he sold them to a pet shop (where I found them). I talked to another reputable breeder because I didn’t know why these two beautiful birds molted so heavily to the extent that they actually lost all their tail feathers – something I doubted would have happened in the wild. This breeder told me that they were probably inbred and irresponsibly bred. He had often seen this. I only want to keep these birds in a healthy happy way so I’m going to try to build them a very large outdoor flight. I wish I could set them free but there is no way they could survive in our climate nor would they have the skills even if there were the food they need. ON a good note they are so beautiful and I enjoy watching them. Hi there Chris. welcome to my blog about Australian birds. They are really beautiful birds in the wild, a species we often take for granted here in South Australia because they are so common. You are certainly wise in keeping your birds in captivity. They would not cope in the wild and would soon fall victim to birds of prey or even the weather. Having been provided food for their entire lives would also mean that they could starve very quickly if released. Just enjoy them is my advice. Just a quick question i have a crimson rosella ? 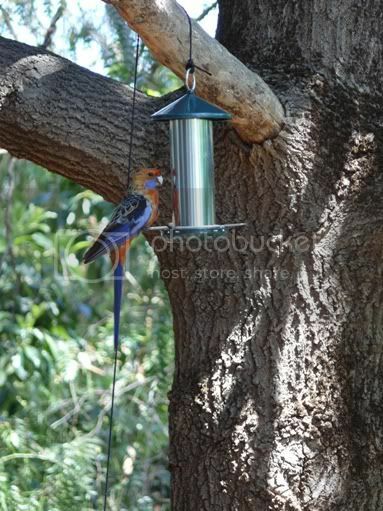 or a Adelaide rosella ? could either be out in a avairy with a galah and budgies and quails and a guinea pig. Thank you for your question. I am not at all experienced in keeping birds in aviaries but I do have a very good reference book. It says that all species of rosellas are aggressive in captivity and should not be placed with other species of parrots. I guess that the galah could fend for itself, but the budgies could become very stressed. I doubt if the quails or guinea pig would be affected. I have had a pair of Adelaide Rosellas visit my yard over a few years. For a couple of years I thought they might nest in a little alcove under my roof as they visited it several times a day for a month or two but I guess they had other options. A couple of weeks ago I hung a feeder in our oak tree which they seem to love. It’s right by my window and they visit several times a day – it’s like having an open Aviary. The pigeons eat the seed they drop but I have not seen any other birds eat from my feeder. Great blog Trevor and I will keep an eye on your tweets now – great photos. Thanks for sharing your great photos with my readers. I agree with you – having lots of birds in the garden is like having an open aviary. Ours is 5 acres in size so we have plenty of birds. My son came across a crimson Rosella while working out in the bush. (North eastern Victoria)It had no tail feathers and could not fly. They stopped the vehicle and picked it up. It is happily living in a large cage in the back yard and has been for over 6 months. It’s tail feathers grow back until they are about 5 cm before they fall out again. It has the colorings of an adult bird. It is on a wild bird seed mix and has access to native flora. We plan to let it go when it has tail feathers and can fly. Is there anything you can suggest? Diet? Supliments? This certainly sounds like a diet deficiency, but this is an area where I have little knowledge or experience. You could try some fresh fruit and vegetables (eg apple, banana, carrot, silver beet, thistle, green feed such as grass). As for supplements try asking your local pet shop owners for advice. The other, more likely, explanation is that it has is an Adelaide Rosella which has escaped from someone’s aviary – they are very common in captivity. It is far too far from its normal range to occur there naturally – though stranger things have happened!! I’m in Glenunga, South Australia. The bird has visited a few times and may come back again, I won’t try to catch it unless i know who the owner is (assuming there is one) because i have no where to keep it. Thanks for that Lyn – I appreciate you helping one of my readers.